As a near-constant-devotee of MSNBC, I was devastated when Tim Russert died suddenly in June. My boyfriend called me when he heard the news because he knew I'd be beside myself - and I was. Tim Russert can never be replaced. Ever. 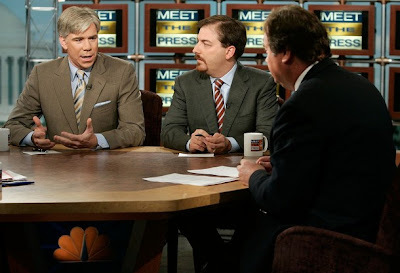 Tim left some very big shoes to fill at NBC News in general and at Meet the Press specifically. There has been much speculation about the heir apparent to the Peacock throne and apparently the king-elect is David Gregory. He is expected to replace guest host Tom Brokaw in the coming weeks. I like David Gregory. I even met him once at a Rockville restaurant. At that point, he was the White House correspondent who did weekend fill-in gigs on the Today Show. When he and his wife and three young kids came into the crowded cafe. I recognized him immediately. First, he's got that fabulous head of white hair, and secondly, he's about 400-feet tall. You couldn't miss this guy if you tried, which is probably why NBC selected him. Gregory stood impatiently waiting for a large enough table. Who could blame him - trying to keep three little children happy and quiet is no easy task. I called over my waitress, relinquished my large booth to his family, and moved to a smaller table because it was a nice thing to do. But I was also agog because he was a broadcast news celebrity - literally the top of the gene pool in my little world. After I moved to the smaller table, David Gregory came over, smiled that huge smile, and thanked me for my generosity. I was transformed instantly into a simpy school girl. Gushing the gushiest gush of all gushes, I exclaimed, "Oh, I just love you on TV!" ACK!!!!! GAG! Going gooey over David Gregory is one of the top five greatest gaffes of my life. I'd do anything to take it back, anything. I was so... nauseating! So much for my brush with a news celebrity. But back to my original point. 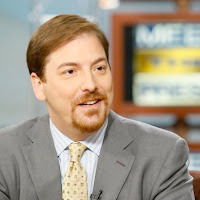 If I was Queen for a Day at NBC News, I would tap Chuck Todd as the next host of Meet The Press. I am a true Chuckolyte (and yes, that's the term - see Viva Chuck Todd and Chuckolyte if you don't believe me). NBC's political director is no smooth, sophisticated on-air presence--but neither was Russert when he took the job back in 1991. His call of Campaign 2008 has been exemplary throughout the primary season so he obviously has a spot-on sense of the political pulse. The public policy and foreign policy aspects of Meet the Press would be unchartered territory. Chuck's down-to-earth, real-guy persona is indeed Russertesque. This explains his appeal. He's not the 6'5 gorgeous and perfectly coiffed David Gregory. Todd is imminently watchable because his love of politics, his zest in being on the ground, in the numbers, figuring it all out - just like Russert. If Chuck Todd whipped out Tim Russert's whiteboard, no one would be surprised. It would just seem right. Todd presents as an apparent non-partisan, just like Russert. We may guess that these two journalists harbor liberal feelings, but they didn't show. On a network filled with big-personality opinionators like Chris Matthews and Keith Olbermann, Todd offers balance and needed bipartisanship. Chuck Todd is young and new, which is why NBC News won't select him. It would take vision and courage to choose this new guy to take that great old guy's place. NBC News once had mucho cajones - that's why they picked Russert. But now they'll take the safe route and crown David Gregory. What a shame. If Tim were still here, he'd be the leading advocate for Chuck Todd. For this and a million other reasons, it's too bad Russert is gone.